Osmania University Placements: Osmania University has been ranked 23rd in Universities category according to the NIRF India Rankings 2017. It has an entrenched Placement Office furnished with the latest infrastructure and productive Campus Recruitment Program (CRPs) conducted by numerous esteemed organizations. Directorate of Placements Services, Osmania University: The Directorate of Placements Services is hosting a separate web portal to benefit the students to find a suitable job and also assist the employers to select the right candidate. An android application has also been incorporated to yield easy access to the students. The concepts of a Dream job and second job opportunity really help the students to get placed in a well-reputed organization. There is no internship available which is done in Bachelors at OU. 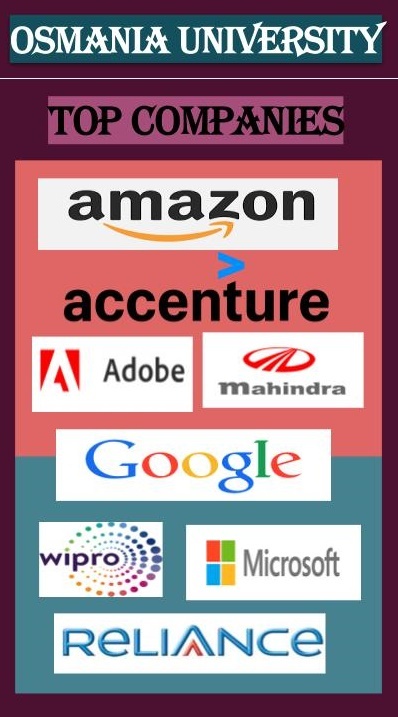 The companies that come for recruiting the students are Amazon, Cognizant , Genpact and other BPO's. The alumni network is not that good. Companies like Infosys, Genpact, etc come for the placement here. If you've cleared all exams and have a respectable percentage score and basic communication skills, you can be assured of getting placed at Osmania University. Key Companies like ITC, Oriental Cement, Britannia, some textile mills and a few other food and garment organizations recruit students from University College of Technology (UCT). It's one of the few colleges where many students get an opportunity to work in their core fields of Food, Textile and Chemical Engineering. highest salary figures goes to about Rs. 6.5 Lakh per year offered to a couple of outstanding students. Average salary offered is Rs. 300,000 per year. There is no placement process. I have not done any internship. The highest salary is not INR 30 lakh per year. Previous year two students placed. Normal package range is between INR 8 lakh to 12 lakh per annum. Not get any placement and no internships. After the completion of the diploma, there will be campus placements arranged by the college. Mainly blue-chip companies Salary will be between INR 20 to INR 30k Alumni network is poor. I have done a project on Cost analysis and Control at Hyundai Motors Pvt Ltd.Hyderabad for 45 days in the finance field. The placement facilities offered to students at the university is good. The average salary offered at Osmania University, Hyderabad Rs. 3,00,000/- per annum. No one can be hired directly after graduation from arts. There are some placements in organisations for economic analysis.The average salary is generally discussed by the company and the student and figures are not disclosed. There are huge opportunities for pass-outs, especially in the IT sector, sector. I think the average salary is INR 2,50000. Osmania has got a very strong network for Alumni's. And they convene every semester for a get-together and a brief recap on past and recent events preferring solutions on how to improve the university learning environment for new students. Placement is average at Osmania University. There is a good career in teaching and industries and also in pharmaceutical. If you are eligible to get the scholarship from Osmania University, the candidates are offered with financial support. The top recruiter companies like Site, Wipro,HCl, Infosys, amazon, etc are showing interest to conduct placements in Osmania university since many years. Average salary has been improved year after year. No. So far I have not done any internships. Highest might be INR 9 lakhs per anum. Average may be INR 4-5 lakhs per anum. Great alumni network is associated with our department. The average salary figures are INR 1,50,000.